The American legal system today is the most significant in the world, yet until the publication of Fundamentals of American Law, there has been no book that provides both the basic rules on the theoretical understanding necessary to comprehend. This book is not simply the work of a single author, but a collection of especially written essays, each by an expert in the field, all of whom are on the faculty of New York University School of Law, which is recognized as one of the elite law schools in America and which offers this book as an element of its unique Global Law School Programme. The book is written specifically for foreign lawyers and law students who have a need to deal with American Law generally, but are not seeking to become specialists in any one area. For them, it is vital to understand the basic principles of a wide range of American legal fields so they can act as informed intermediaries between their public or private clients and their American counterparts. 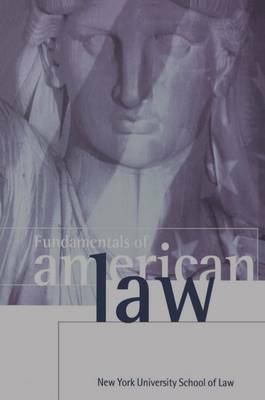 The book not only provides the reader with a solid foundation in American law, but will also serve as a basic reference book for the fundamentals, even as some of the details change over the years. Although initially conceived to fill a void for foreign lawyers, the book is also ideally suited for others who have a significant need to understand the basic principles of American Law and to interact with American lawyers. For this reason it will be an ideal course text for students of business, accountancy, political science, or public administration, where the enquiring student will constantly find intersections with the law. The book is more than a compendium of legal principles. Each chapter explains not only what the law is, but why it is that way. It sets forth the policy considerations in institutional factors that produce a particular law so the reader can make an independent judgement about its wisdom and perhaps its adaptibility to other cultures.